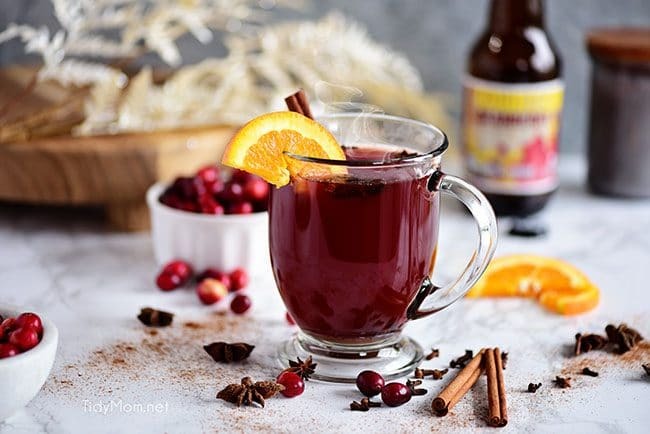 This warm Cranberry Mulled Ale recipe is brimming with festive flavors. Full of cinnamon, honey, ginger and nutmeg, the drink smells and tastes just like Christmas. 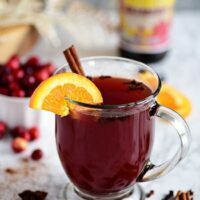 If you like mulled wine or are looking for a warming winter drink, I bet you’ll love this mulled beer! 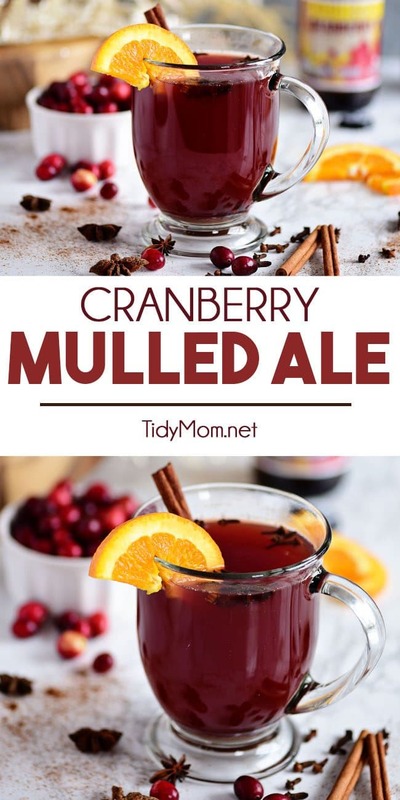 Get ready to fill your house with the aromas of the season, with this festive Cranberry Mulled Ale. A simple warm cocktail that’s spiced and sweetened to perfection. 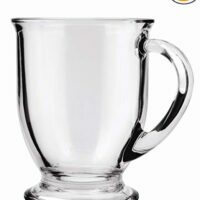 We all love our beer ice cold, but with colder weather moving in it’s time to say goodbye to the chilled beer glasses, and hello to a mug full of hot beer. I know, I know, It sounds crazy, but stick with me on this one and you won’t regret it. It’s a drink so good, even your traditional beer haters will be snagging sips of yours while no one is looking. 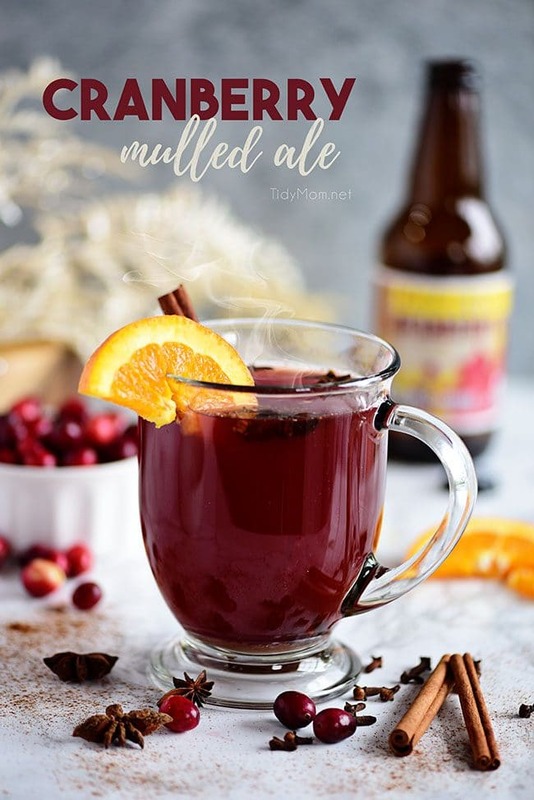 Mulled ale delivers a warm spicy essence with hints of allspice, nutmeg, anise, cinnamon and clove, and manages to stand in that perfect middle ground of not bitter and not too sweet. You can always add more honey to your liking if you prefer a sweeter drink though. The drink is officially defined as an ale that is mulled by sweetening and spicing, then heating; it was sometimes thickened by the beaten yolk of an egg. Mulled ale or hot beer as it’s also called has been known to be a very popular drink in England dating as far back as the sixteen hundreds. So if people have been drinking it for that long it must be worth the hype, right? Choose the right beer When it comes to this it’s really all about preference. You can use an ale or a shandy (stay away from hoppy beers). I chose the cranberry ale because it fits better with my personal preferences, but you could also go with a holiday flavored shandy like the Jolly Traveler if you’re more of a shandy fan. Pick your juice This step also depends on what beer your pic and your personal preferences again. If you like cranberry more than pomegranate go with that. Or cranberry juice is a good additive if you can’t find a cranberry beer. You could also do a little half and half action with the two juices, I’m sure that would be amazing! Never Let It Boil You’ll want to keep the mulled ale warm until you’re ready to drink it to ensure the best taste, but never let it boil. It’s important not to keep the heat too high though because then the alcohol will start to cook off, and no one wants that tragedy. If your stove has a simmer setting, chose that, if not keep it on one or a max of 2. The best part about this mulled al recipe is that it’s so easy to adjust the recipe for the amount you need. 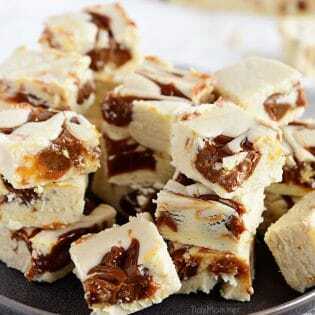 You can follow the recipe as is, or grab a big pot and a 6 pack of beer and serve a whole crowd. Just put your stove on simmer to keep the mixture warm, and you can come back for more whenever you need to off your cup! 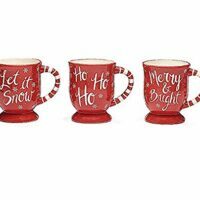 I love serving it up in a festive mug garnished with an orange slice and a stick of cinnamon to really get me in the holiday spirit! 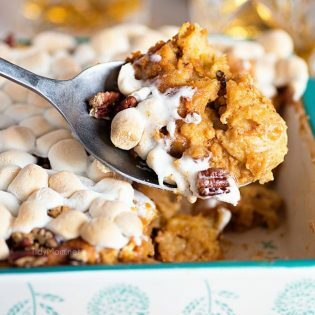 There’s no better way to spend a night than watching movies in front of the fire with a mulled ale in one hand and a slice of Caramel Butter Pecan Cake in the other. Cranberry Walnut Sweet Potato Rounds Serve these sweet potatoes as an appetizer or side dish -They’re highly addicting and full of holiday flavor! Cranberry Moscow Mule The perfect holiday cocktail! Thanksgiving and Christmas with the family just got a little easier. Turkey Cranberry Toppers This recipe transforms leftovers into the star of the show when you top buttery Ritz Crackers with melted swiss cheese, turkey and cranberry sauce. Cranberry Pomegranate Champagne Cocktail Made with pomegranate liqueur, cranberry juice, and champagne, you are only three ingredients away from the best holiday drink! Turkey Bacon Pancakes With Cranberry Maple Syrup The perfect tart, tangy, sweet and salty breakfast the whole family will love. Sparkling Cranberry Gin Cocktail Bubbles make everything better, especially when you add them to this five-ingredient sparkling cranberry gin cocktail. 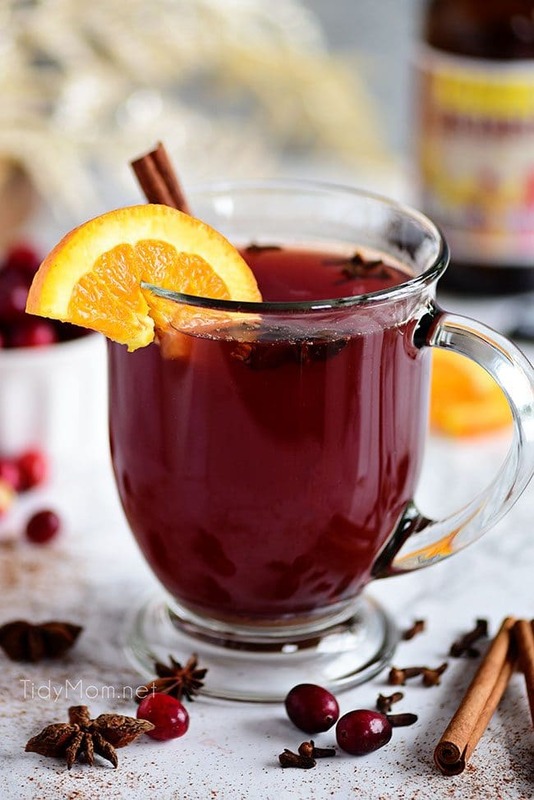 Like This Cranberry Mulled Ale Recipe? Pin It! 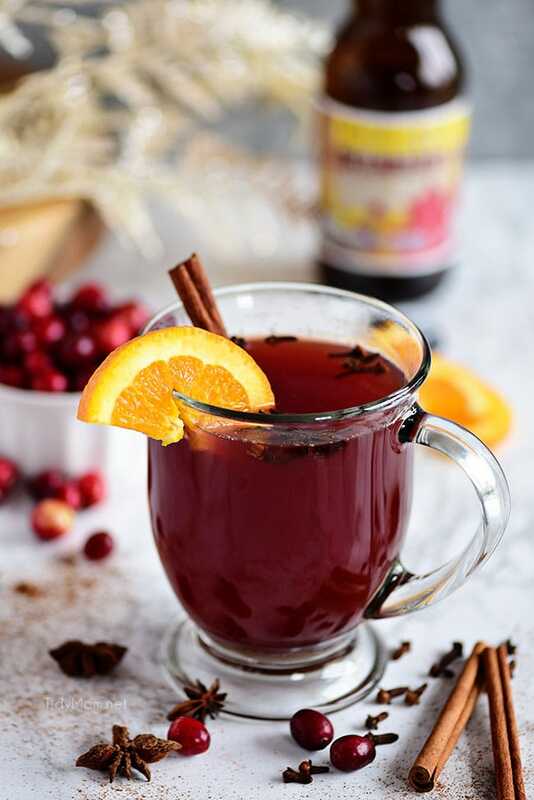 This mulled ale is just too simple and too delicious not to make this holiday season! Don’t miss your shot at enjoying a cozy festive drink to warm your soul this season. I can’t wait to hear how much you love it! If you’re looking for even more inspiration check out the fun little group I created on Facebook, I’d love for you to join in! It’s a place where you can share YOUR favorite recipes, home tips, creative ideas and ask questions and see what’s new with TidyMom! If you’d like to check it out, you can request to join HERE. Using a small saucepan add ale, juice, honey, and spices. Bring to a gentle simmer on low to medium-low heat. If the beer begins to boil, turn down the heat. Allow to simmer for at least 2-3 minutes to infuse the spices. Remove from heat and add the brandy. Serve in mugs with an orange slice and cinnamon stick. I think this is going to be my new holiday drink. So good, so much flavor! 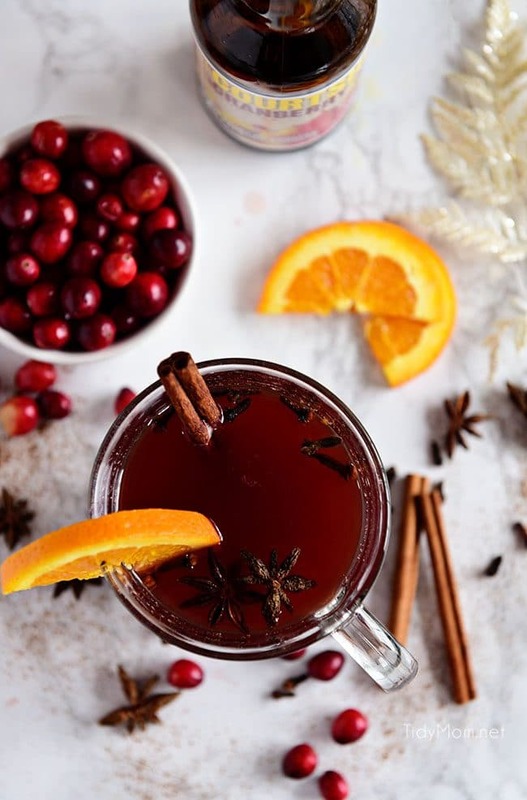 I am drooling over this drink – so delicious and full of cheer! I LOVE this stuff! Drink it all the time! Yes please! I’ll take two! This is the best!